Shabbychick Junk. : Another Fairyland card! Oh man, I had so much fun with Crafty's new "Fairyland" set when I got it, I just kept cranking out samples because there are SO many images to use in this large set. This card is super large because I wanted to add a lot of 'dreamy' elements to it, like the cool bird that comes in this set, and tickets, and glitter swirls! The patterned floral paper is from Crafty's "Classic" paper pad. I sewed it to my card and then started adding elements around my main image. Supplies: Crafty's Fairyland, Journey and Mini Memories sets, Copic Markers (salmon pink, mint blue, buttercup yellow, sand, dull ivory, light walnut, spring dim green, Martha stewart glitter, Making Memories chipboard swirls, white organdy ribbon. Sewing machine, thread. FANTASTIC!!! 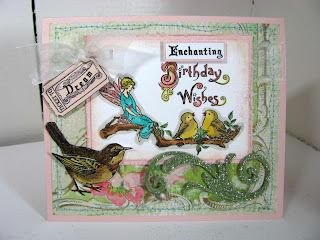 LOVE all the dreamy elements you've put on this card!! And the bird is a wonderful added touch!! Awesome work as always!!! You ROCK!! CHA treats, I'm off & running! WOO HOO! I'm a guest designer for Whippersnapper!